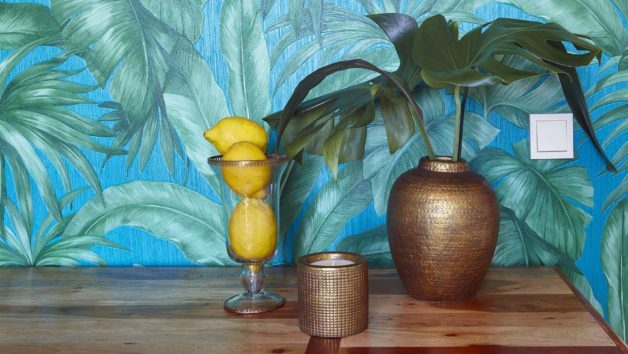 In case you haven’t heard, tropical decor is having a moment right now. Exotic colors and textures—fit for a balmy oasis like the Bahamas or Fiji—have been making a splash on the 2017 home design circuit. And we can’t get enough of the scorching trend. But how do you embrace the look without appearing like you took a time machine to the set of “Miami Vice”? The key is to keep it simple, according to Lane McNab, a Berkeley, CA–based interior designer who’s mastered the art of infusing eye-catching decor into homes in a sophisticated way. “There is nothing worse than a room that feels themed or unintentionally kitschy, and tropical decor can go overboard really fast,” McNab says. And nobody wants that. We’re here to help you walk the fine line between trendy and Tarzan. Follow these tips to get your home looking lush and luxurious. Sure, tropical looks can be loud. But that doesn’t mean they have to be tacky. Take, for example, the Martinique banana leaf wallpaper at the Beverly Hills Hotel, an iconic print that’s also made its way into celebrity homes and expensive restaurants. It’s a print that screams glamour and has inspired many iterations in wallpaper, fabric, and decor. Or try a luxe green leaf pattern by designer, author, and blogger Justina Blakeney, whose popular blog “The Jungalow” is a destination for bohemian design inspiration. You should also be mindful about where you apply it. 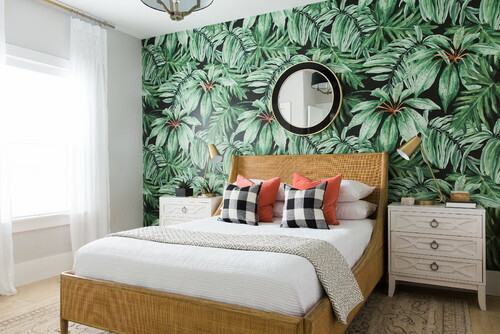 Bold patterns look best in small doses, experts say, so consider using a tropical print in a powder room, in an entryway, or on an accent wall behind a guest bed. Not ready to commit? Etsy has a whole slew of removable wallpaper options. You’ll want to balance out your tropical decor to keep it from feeling like, well, an actual jungle. Try combining lush prints with an industrial metal such as brass. Gold’s less flashy cousin will make your room look tasteful yet elegant. “Brass details will keep your home looking refined amid the unapologetic flora prints,” McNab says. To incorporate brass into your home, McNab recommends sourcing accessories such as sconces, faucets, side tables, and mirrors. Not quite ready to go all in with those bold, green designs? We get it. But you can still achieve a taste of the tropics through more muted looks. Enter design’s latest (old) obsession: Grass-cloth wallpaper. “Nothing is hotter right now than grass-cloth wallpaper,” McNab says. Yep, the stuff that you spent hours scraping off your parents’ 1970s walls has made a comeback in a big way. Designers love it because it’s versatile, pairing well with a variety of looks, from rustic to modern to, you guessed it, tropical. That’s because its texture conjures up island vibes in an understated way that can work for any style of home. McNab recommends selecting grass-cloth wallpaper in a light, neutral color and pairing it with sheer draperies for a fresh look that doesn’t go overboard. Grass cloth can work in any room, but it makes the most sense in a dining room, bedroom, or hallway. 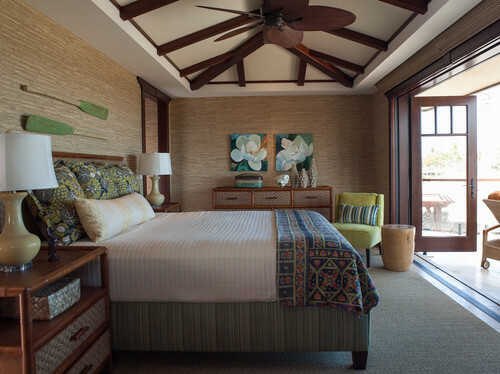 “Add in colorful accents such as blues or coral reds, and your space will feel bright, airy, and elegant,” McNab says. This one’s a bit on the nose, but the most foolproof way to add the lushness of tropical decor to your space is to bring in houseplants. Not only are they a fantastic design element (if chosen well), but they also clean the air and make rooms feel fresh and inviting. “Large-leafed plants like a fiddle leaf fig really bring in that jungle vibe, while indoor rubber plants with their black-green leaves feel sophisticated and graphic,” McNab says. Hang a group of staghorn ferns on a blank wall for a tropical reinterpretation of a gallery wall that feels chic and elegant at the same time.